Seoul, South Korea (April 25, 2018) – CJ 4DPLEX Announced today at CinemaCon 2018, as the convention wraps up, a new partnership with Silverbird Cinemas, which will bring the first 4DX site to Nigeria. 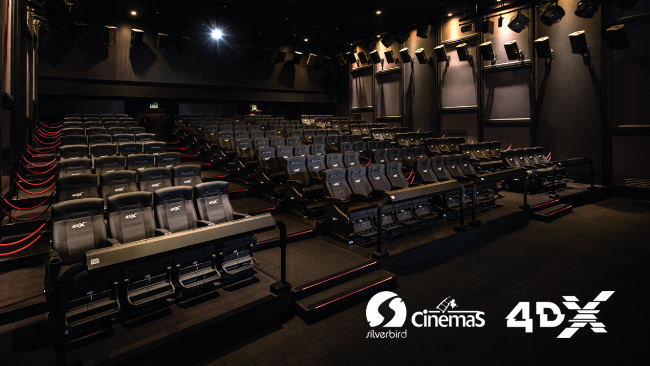 The 4DX theatre will be located at the exhibitor’s Ikeja location – the highest-grossing cinema in West Africa. The second 4DX site will be opened in Abuja, the capital city of Nigeria. CJ 4DPLEX is the world’s first 4D cinema company, headquartered in Seoul with international offices in Los Angeles and Beijing. The company created 4DX, the first and leading 4D cinema technology for feature films, providing moviegoers with an immersive cinematic experience that utilizes all five senses, allowing the audience to connect with movies through motion, vibration, water, wind, snow, lightning, scents, and other special effects that enhance the visuals on-screen. CJ 4DPLEX brings 4DX auditoriums to exhibition partners along with 4DX codes for both major Hollywood blockbusters and local titles. Each auditorium incorporates motion-based seating synchronized with more than 20 different effects and optimized by a team of skilled editors, maximizing the feeling of immersion within the movie, beyond the limits of audio and video. Since 2009, more than 520 Hollywood and local titles have been screened in 4DX. As of April 2018, more than 61,000 4DX seats operate in 500 auditoriums spanning 58 countries. CJ 4DPLEX was named a Most Innovative Company of 2017 in Live Events by Fast Company. The company was awarded the Silver Edison Awards in the Media and Visual Communications-Entertainment category in 2015 and 2018. For more information, please visit www.cj4dplex.com.